What is a winding staircase? A winding staircase is a specialized curved stair with a small footprint and big impact. These graceful stairs require absolute precision with no margin for error. When expertly planned and constructed, these unique staircases offer a solid foundation and durability to last throughout the years. Winding staircases are considered the pinnacle of stair craftsmanship. Constructing these unique and complex stairs requires advanced woodworking skill and capability. 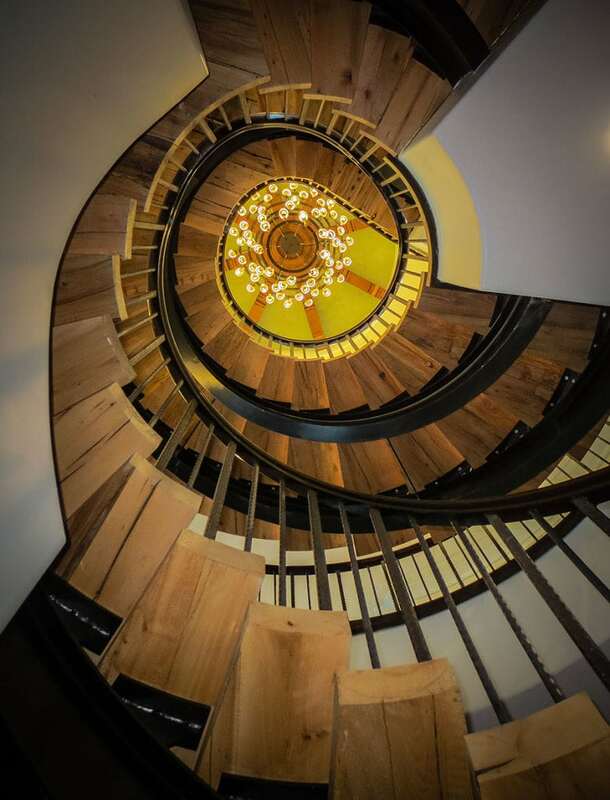 Our creative design team and skilled craftsmen have perfected the art of this circular staircase construction, and the winding staircases we build are both beautiful and functional. How do we design and build winding stairs? The process of building a winding staircase begins with measurements. Our team obtains precise, detailed measurements of the residence or commercial space that will house the staircase. Once the staircase area has been defined and measured, our team will design custom curved stairs, tailored to the style and size of the space. With custom radius treads and risers, these circular stairs come in many shapes and sizes; they are anything but simple. Next in the process, our industry-leading team develops CAD drawings, illustrating the stair design and features. Once a client approves all stair drawings, the curved stair is constructed within our state-of-the-art facility. Through our turnkey installation option, our team delivers and installs the complete circular staircase with the pre-fit handrail system, resulting in a simple and flawless installation process. How do we install a winding staircase? By pre-building the stair in-house and transporting it to the job site intact, we are able to preserve its perfect condition and prevent messy building at the home or commercial site. Whether the staircase is attached to a wall or freestanding, a precise and proven installation process ensures safety and durability. From delivery to installation our expert team is committed to seamless and timely delivery for each of our projects. In addition to the radius and shape of the staircase itself, clients enjoy many options when it comes to style. 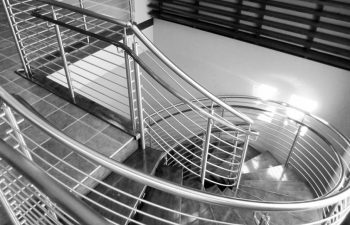 By tailoring the trim and handrail system to the unique style of a space, one can truly enhance a home or commercial building with circular stairs. Modern or traditional, ornate or sleek, our team will work with each client to ensure the staircase reflects his or her style. With materials and finishes that enhance the design of a space, a winding staircase is not only functional, but can serve as a statement piece as well. Visit our curved stairs project galleries for additional details and pictures on our exquisite projects. From inspiration to installation our team is committed to designing and building the highest quality winding staircases. Our reputation speaks for itself and client satisfaction is our highest priority. Contact us today to discuss your next custom stairs project.